Square Eggs = Fun Eggs! We should eat 3-4 eggs a week as part of a balanced diet, and kids especially can benefit from the nutritional properties in them. But a lot of kids (including mine! ), aren't fans of eggs. I was recently made aware of a product that just may make your children go "Ooo" instead of "Eww" when it comes to eggs. The Egg Cuber turns any ordinary egg square! It's so easy to use too. 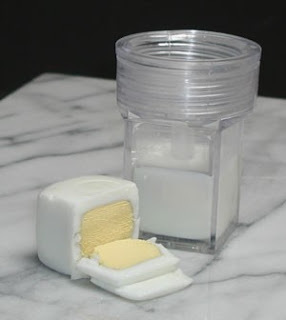 Simply place a peeled, hard-boiled egg into the cuber, press down, chill, and voila...all done! The egg cuber can make eggs interesting again, especially if your children get involved with the cubing process! This innovative product is made by the Australian-based company BioStim. Since 1996, their goal has been to bring a fresh approach to sustainable agriculture and human health. They focus strongly on education, but also have a range of innovative products. A few others that may be of interest to you are their VitaSweet, a 100% natural sugar substitute, and VitaSalt, a real, natural sea salt. Click here to visit the site to learn more about the company and to check out their other products.